Too often, our most-worn clothing items take a backseat to more showy pieces. It is time to give the pants and jeans you wear every day the attention they deserve. The right pairs can make or break your wardrobe. Make sure you choose ones that fit your body and your lifestyle, particularly if you are looking for plus size pants. A favorite pair of pair of jeans will feel comfortable and made for your body, but that doesn't only come from years of wearing them in. At Christopher and Banks, we have a collection of plus size jeans that can make you look chic and sophisticated while giving you the comfort of worn-in denim. Choosing a solid wash and a dark color. Light washes and jeans with fading on the thighs draw attention down toward areas that many full figured women seek to minimize. Opting for darker hues keeps things timeless and streamlined. Jeans in dark blue or black create a sleek backdrop for you to dress up or down from day to night. Using pockets (or no-pockets) to your advantage. Every body shape is different. For some women, pockets only add more bulk to an already curvy area. For women with a straighter figure, pockets can create the illusion of curves where they're wanted most. As you choose jeans, make sure the pockets are proportional to your body. If you go too small, you will look bigger in comparison. Balance is crucial. Finding a size and cut that suits your body: As you try on different pants, think about your body shape and what cut will be most flattering. 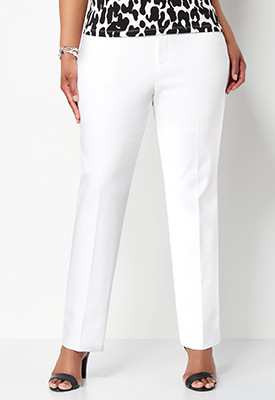 If you are looking to balance out your hips, opt for a boot cut or flared leg to create a more straight-line illusion. Straight leg cuts, figure hugging jeans and ankle length pants can also be particularly slimming – along the same vein as a pencil skirt. These hip hugging styles can look like they were made specifically for you, giving you a contemporary and sophisticated style without a hefty price tag. your wardrobe into more up-to-date fashions. Browse our jeans or consider other sleek pants that stray from classic denim. Women with fuller figures need pants designed for their specific body type, not just pants in a specific size. Unfortunately, most retailers just take existing designs and make them in different sizes, rather than thinking about what elements go into making great pants for curvy women. Less bulk: Thick knits, big pockets and even certain kinds of pleating and ruffles can be a no-no for a full figured woman. Our collection is designed with these things in mind. Any embellishments are placed appropriately to accentuate a full figure rather than exaggerate it. More balance: Every woman has a particular area she wants to minimize or highlight. Striking a balance for every woman is our goal. We offer pants that skim the body and flare out where appropriate to create a proportional look from head to toe. Ideal fabrics: Many plus size women prefer stretch fabrics that have some give. Stretchy clothes, however, are often made to look more casual and relaxed. This is less than ideal if you are looking for comfortable office or evening wear. Our stretch fabrics, such as the ponte knit, feel tailored and skim the body, rather than suffocate it. The result is a comfortable but structured fit ideal for the full figured woman. Modest rise: Many of today’s pant styles aim low, with a waist band that sits just above the hips. We have styles of mid to high rise jeans that still look in line with today’s fashions. You’ll never feel over exposed or out of date in pants from Christopher and Banks. You’ll be sure to look your best when you build your closet with Christopher and Banks. 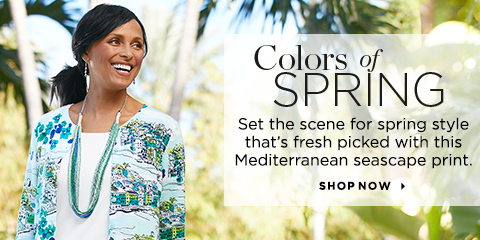 Browse our collection for items that are versatile and designed to be worn from season to season.